So, you got the gun. You got the holster. You’re almost ready to go but you realize the brown dress belt you used for prom isn’t going to hold the weight of your new pistol. So, what next? Well! You’re going to need a gun belt. 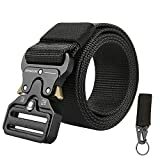 We are going to cover the different nylon material gun belts to help you make a decision on what is the best nylon gun belt for you specifically! One thing you might miss over is the actual width of the gun belt. If you buy a belt that is 2.5” wide but your belt loops will only fit 2” worth of belt then the belt is obviously not going to work for you. So, just make sure to know how much width of a belt your belt loops can actually fit. This will depend on the person you are and what your wardrobe looks like on a daily basis so it is good to keep in mind. Some gun owners will consider a gun belt unnecessary, as some would consider a holster unnecessary. We would highly advise against this. A gun belt is necessary to hold the gun and holster in the same place. Without it, the gun holster will flip flop around inside your waistband or outside and when you go to draw the firearm the grip won’t be where you expect it to be. A gun belt also limits the chances of the gun being dropped which can cause a negligent misfire just due to the impact. The gun belt also needs to have a rigidity which is usually obtained by manufacturers adding a stiffener to the belt which is either metal or plastic. This stiffening ensures that the belt is going to be able to hold the weight of your gun and the holster. There are a lot of different opinions on whether a leather gun belt or a nylon gun belt is best to use for carrying your gun in a concealed manner. There is no clear answer on which one is better as each one has it’s own positives so it will depend on your own personal choice. However, we will cover the differences for you so that you can make an informed decision. The first thing to consider is that the cost of nylon material is much cheaper and efficient to make than that of animal skin, which is what leather is. Also, nylon is able to be manufactured to be just as strong as leather which causes a lot of gun belt buyers to lean towards nylon gun belts due to this argument. Now, although nylon is cheaper it does have it’s downsides as far as the material itself is considered. Nylon’s degradation can happen at high temperatures over time and also might stain your clothing if it gets wet over a period of time because it does absorb water. Leather, on the other hand, isn’t susceptible to hot temperatures but it can be affected by your sweat. Also, if you are somewhere where it is going to get wet you might want to consider keeping it oiled with something like linseed oil which will contribute to a higher maintenance factor than nylon does. Another thing to consider is simply the appearance. A leather gun belt can pass as a regular dress belt or even a regular belt in general but a nylon belt can look more “tactical”. This will depend on your overall wardrobe and clothing personality anyways but another thing to consider for sure. The appearance is big to consider because you might find a belt that looks super cool but when you actually possess the belt and are holding it in your hands you might realize it’s not going to work with your outfit. Or, it will, but you’re going to look like your obviously carrying or something of this nature. Appearance isn’t just about the cool factor but also about discretion with a concealed carry. Some belts are also just more comfortable than others. Usually, other customers will let you know about this and we’ll go into the details for you. Most customers will review a product that is uncomfortable and they’ll be sure to let you know that lack of comfortability is the reason they are reviewing it. Thickened high-quality nylon belt and strength metal buckle. The KingMoore Tactical Belt comes in with three different sizes and three different colors! This gives you a little bit of customizability which we all seem to like nowadays. The nylon was double webbed to make it thicker with a metal buckle to hold everything together. They use a special type of braid to enhance the comfortability and flexibility of the belt. The metal buckle is made with airplane-grade aluminum alloy and is made to resist high impact from an external force so you know that it will remain durable and intact. The belt is firm and able to handle any extra attachments for any survivalist wanting to use it for routine, daily wearing. One downside that is being reported is the actual belt buckle itself. The belt buckle has two latches that people have experienced it coming undone when bending over or by being brushed against some sort of external object which leads to customers being unable to use the belt since it was occurring quite often for them even though the belt itself is well made. High density five-part laminate construction for extra durability. The Bianchi Accumold belt comes in with a shatter resistant buckle that has three latches for added security to ensure the belt buckle stays buckled. Its designed with a 5 part high-density laminated construction for increased durability. This also includes a ballistic weave fabric with a foam center and stiffener sandwiched in between to give it the toughness and strength to hold your gun and holster without ruining the belt. The foam center offers additional support but also contributes to the comfortability. Customers are pretty happy with the belt buckle design as the 2 part opening allows that added security. You essentially have to squeeze the top and bottom and also click a button with your other hand to undo the buckle. This is going to ensure that the belt doesn’t unclip when you’re moving around in your day to day activities. Some customers complain that the ultra-stiffening and added strength to the belt actually removes any option of flexibility so it can be quite stiff. 【CONCEALED CARRY / EDC】 Our tactical belt is stiffened to support any IWB or OWB holster without rolling over. NO BEND, NO SAG. Also great for everyday carry tools or survival gear. 【INFINITELY ADJUSTABLE】 No holes in the belt, so you can freely adjust it your comfort! When choosing a belt size, add 1 to 2 inches to your waist size if you intend to carry a firearm. The XTAC quick-release belt has five different sizes and a black or tan color option. The belt is made of double-webbed nylon with added stiffener for increased durability and is expected to last you forever! It can be used for IWB and OWB holsters and any other survival gear you might be using. It has an easy seat belt click to undo the belt and has infinite adjustability by just tightening and loosening the belt. The manufacturer states to add 1 to 2 inches to your waist size if you plan on carrying a gun with it. All this with an awesome money back guarantee if you aren’t satisfied! 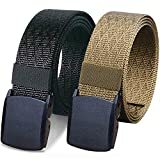 People find the XTAC belt to be slim and minimalist and also stiff enough to carry their gun and holster in comparison to higher end gun belts that may be stiffer but also cost four times as much. The problem customers experience is that the belt buckle doesn’t fit through the belt loops without a little bit of finesse. The bigger issue is that some customers have a problem with the belt clasp coming undone due to it being a simple seatbelt one-click quick-release buckle. 【CONCEALED CARRY / EDC】 Our belt is stiffened to support any IWB or OWB holster without rolling over. NO BEND, NO SAG. Also great for everyday carry tools, or survival gear! 【LIGHTWEIGHT AND COMFORTABLE】 NO METAL in the buckle keeps our belt light, but still super strong. It will never loosen and is airport TSA friendly! 【INFINITELY ADJUSTABLE】 Don't be restricted by leather gun belts with holes! Freely adjust our belt to your comfort according to the firearm, equipment, or gear you carry. QUALITY GUARANTEED Buy from a US-based company. Our products are backed by a 100% Money Back Guarantee! The Mission Elite tactical belt has six different sizes and three different colors. It’s made with the double layered nylon webbing and is reinforced for that increased rigidity you need to carry a gun. The stiffener applied removes any chance of sag or bend on your belt. The belt buckle has no metal so it’s lighter than other belts and holds the tactical advantage of what a gun belt needs to be operational. The belt is also adjustable by simply tightening or loosening it without being limited to a certain amount of holes. The belt does have a different way to cinch up that’s not very intuitive. It comes with a recommendation to watch the youtube video to learn how to cinch it up, which can strike one as a little odd and implies the design might need some work. Other than that the functionality of the belt is top notch! ADJUSTABLE WEBBING BELT: 100% Nylon web belt, 1.5 inch wide belt. Holeless belt and removable buckles that it's easy to trim it to size. Belts for men waistline girth below 42 inch. Lifetime guaranteed refund policy. If any problem of these nylon web belts, don't hesitate to contact with us. We promise to provide you a satisfactory solution. HAPPY DAY! The WYuZe Nylon belt is another belt using the non-metal buckle to keep it ultra lightweight and comfortable. It is strong enough to withstand 500kg of weight without any sag or deformation. It is 1.5 inches wide and instantly adjustable to get the belt down to the right size for your waistline. The WYuZe company offers a lifetime guarantee on this product so if you ever have an issue with it you can get it replaced without a problem! Some customers are saying that the buckle comes off very easily and renders it useless, although this isn’t a widespread concern. Most customers are happy with the quality of the buckle but the unhappy customers generally state they wish the design didn’t allow for the buckle to slip off at all. Now you have all the information you need to go and find the best nylon gun belt for yourself! You should be able to bypass all the information that doesn’t really matter to be able to hone in on the exact product that you need for your individual needs. You’ll know what you need to maintain an expert level of safety and you’ll know what’s comfortable, what’s strong, and what’s going to hold your gun in place so when you draw it! That’s it for now! Stay safe!